Is Pilates a good exercise if you have osteoarthritis pain? Exercise is recommended when you have osteoarthritis, but you want to look for exercises that have a lower impact and won't stress joints that are painful. Pilates can be a good choice. The Pilates exercise system is named after its creator, Joseph Pilates. It focuses on the core postural muscles that keep the body balanced and the spine in healthy alignment. Pilates was first developed in the early 1900s to improve Joseph Pilate's health and that of fellow World War I prisoners of war. In the 1980s, Pilates regained popularity among dancers and others who were interested in its health benefits. Pilates can be taught using special Pilates equipment in settings that are private or semi-private. There are also group classes performed on mats that do not use Pilates equipment. Sessions with a Pilates instructor can be expensive, similar to the cost of a personal trainer. 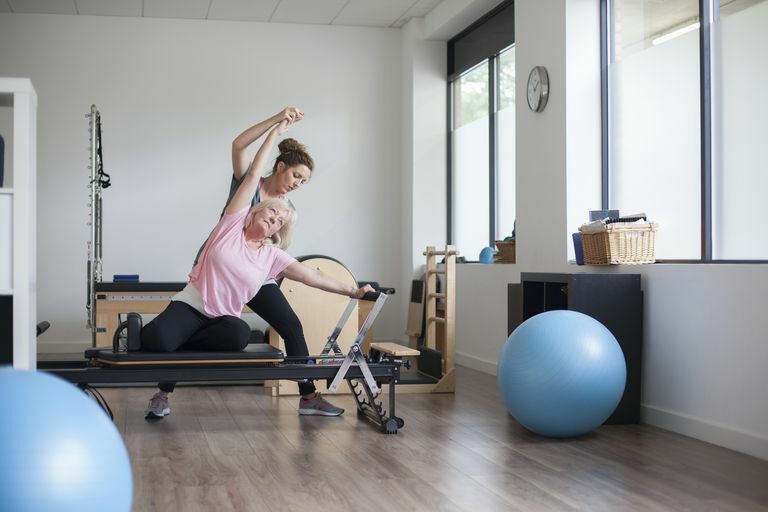 A group class will be more affordable but may not provide the individual coaching needed, especially for a person with debility from osteoarthritis who may need modifications to the exercises while learning them. Mat exercises focus on strengthening the trunk muscles and hip muscles while increasing the flexibility of the spine and hips. Mental focus is used to perfect movements and muscle control. Awareness of proper spine position is vital while exercising. Development of deep muscles of the back and abdomen supports proper posture. Breathing techniques are used to promote mental focusing and centering. Lengthening, strengthening and flexibility increases in the muscles. Pilates can offer many health benefits. Specific to osteoarthritis, Pilates movements lengthen your body and this might help relieve soreness. Stretching is thought to help with blood flow and the delivery of nutrients to muscles and tendons. Better circulation may also serve to relieve aches and stiffness. Subtle improvements in posture may also result in fewer aches and pains. All Pilates exercises start in your core (your abdomen), stay in your core and end in your core. Before trying Pilates exercises, you must learn how to move from your core, and only then will you be able to realize the full benefit of Pilates. Should You Start a Pilates Program Today? Because you have a chronic medical condition, check to be sure your doctor has no objection to you beginning a Pilates program. Most likely, your doctor will encourage your participation rather than discourage it. Once you have the approval of your doctor, learn about the top ways to learn Pilates. Austin, Denise. "What Pilates Can Do for You." Prevention. November 2011. "Pilates Exercise System to Promote Back Health." Spine-health.com. 12/12/2007.